If current technology trends are any indication, it’s possible that human lifeguards could be replaced by robots in the future. So far, we’ve seen aremote-controlled rescue buoy and a salamander-like bot that travels on both water and land, among many others. 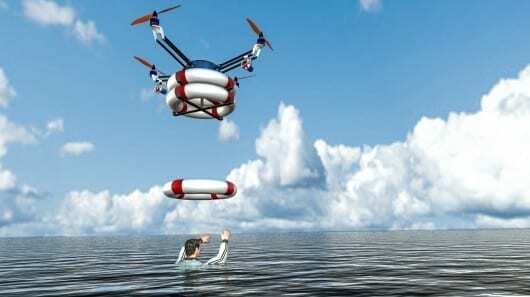 Rather than having to cut through rough water to get to folks in trouble like many search and rescue robot designs, an Iranian research center proposes a quadcopter called Pars that launches from a floating platform and drops life preservers precisely where they’re needed. The Pars design calls for a lightweight quadcopter equipped with a slew of sensors, including accelerometers, gyroscopes, GPS, a barometer, and an electronic compass. It’s most distinguishing feature, however, is a series of latches underneath that can hold and release life preservers one at a time. The most recent design can hold three tubes at once, but the developers claim future models could stock over 15 by using a chemical material that expands the padding after release.